This 5* hotel caters for adults only and is set in a high class location, just metres from its own beach for guests to enjoy. If you want no children and go to bed before 10pm this is for you. Firstly this is an unbiased and honest review of this hotel. Drinks quality very poor, beer very weak, local spirits are a joke. I drank beer all day to keep cool and never felt drunk. Food in the main dining room was very average compared to many other hotels we have visited in Egypt. Absolutely nothing going on daytime or evening, and very isolated. This hotel is no.1 on Trip Advisor. ......don't be fooled by this, we were at our cost. While I am on the cost subject the price for this hotel has increased since our visit to "silly money". Rooms were poor our bedding was not clean ie no pillow protectors and bedding stained. On the plus side a la carte's were ok food quality better than buffet. There are far better hotels in Hugharda. The main plus of this hotel is the adult only theme. These are the best rooms I have stayed in. Enormous,quality linens, beautifully kept and enormous bathroom. Robes and slippers were included and there was always ample hot water. I would like to try the deluxe rooms as they look superb! The food in the hotel was very good. Excellent breakfast with so much choice. I liked to eat lunch near the pool but the Turquoise restaurant was also open. The Italian a la Carte was too die for. Not sure about the fish restaurant as my husband doesn't like fish! There is also a Chinese, Indian and Japanese. This entertainment is low key which is exactly what was required. Service is exceptional everyone was so friendly. We were so impressed we will be returning in a couple of weeks. Hotel tip: All rooms are great! We had a side view of the sea but it was still wonderful. My wife and i made a 2nd trip to this hotel a year after our first trip, we had a great time last year and amazingly this years trip was even better,from the minute we stepped into the main entrance to the minute we left, everything was first class. Once again the staff couldn't do enough to help us , we were upgraded upon arrival which was a nice touch, we were made to feel really welcome. The staff who work there are so hardworking but always remain cheerful and friendly,Hany who works by the pool was a star , everyday he kept us topped up with drinks and a smile, and Carlos (another star) who worked around the pool last year was now working in the lobby bar, i was amazed that he actually remembered us from last year and where we came from,he made a point of coming over and chatting on our first night, he waited on us every night in and around the lobby bar after that and always had made a point of coming over for a quick chat despite being exceptionally busy. Our [massive]room was cleaned every day to a really high standard,and fresh bottles of water put in the fridge. The food in the restaraunts was unbelievable, so much choice and prepared to perfection. We were asked a few times over the week by the management/guest relations whether everything was ok , and i had to say that it was perfect last year and this year was perfect +10%. The only slightly disappointing thing about our stay was that the sea was quite choppy during our stay and therefore the red flag was flying most of the time , but even the hotel management can't do anything about that, when the yellow and eventually green flag was raised i managed to get some great underwater photos around the reef.overall the weather felt warmer than last year and didn't seem quite so windy, daytime temps ranged from maximums of 25-28c during our week and the nights were pleasantly warm , we even sat outside at the italian restaraunt on our last night. Whilst we were there we hired pushbikes on 2 occasions and cycled around to the other end of the bay into Sahl Hasheesh to take in the beautiful scenery, i would recommend that activity. We didn't use the spa in the hotel but i managed to get myself into the gym on one occasion( i intended to do more but thought , what the hell i'll stay here and drink beer). We didn't see any of the entertainment in the Long Bar but tha was a choice not to , we just wanted to chill. Last year we visited the hotel to [belatedly] celebrate my 50th birthday, i didn't think we would be able to go back quite so soon however i'm so glad we did and we are already talking about going back again in 12 months. i would advise anyone who is considering going to the Premier Le Reve to stop considering it and get it booked , you won't regret it. This was our second visit to this lovely hotel. When we arrived we were updated to a superior room for free because we were return visitors. The room we were given had a sea view and was beautiful, spotlessly clean and very big, We had a basket of fruit and a small bottle of wine waiting in the room for us. Our room key gave us access to the executive lounge which is 24 hours. Most of the staff recognised us and we were treated like royalty for the whole week. The staff are amazing nothing is too much trouble for them, Hany kept us in drinks by the pool and is such a happy cheerful person, he kept us entertained all day, and Carlos is a star and looked after us in the evenings. The day and evening managers also took the time to speak to us everyday to check that everything was ok. The entertainment in the long bar is excellent, the resident singer Damien is very versatile and could be seen at various locations around the hotel and pool areas, singing and either playing the guitar or piano. Jodi the event's organiser is a friendly bubbly person and walked around the pool area and hotel everyday and always stopped to talk to us and to all the other guests. This hotel deserves its 5 stars, it has got it just right with the staff and management who are the best I have ever encountered on a holiday. All the staff are amazing and are an asset to the hotel. The food in the restaurants is very good and there is always plenty to chose from. The rooms are beautiful, the gardeners keep the grounds immaculate and the whole place is spotless. We dont usually go back to the same place as there are so many places to see, but will be returning later in the year either in November or we may go for Christmas. This Hotel is superb and certainly lived up to it's billing as the No1 Hotel on the Red Sea, from the moment you walk into the marbled main reception area the splendour of this place hits you, it's large spacious clean and bright , all of the hotel staff were friendly, polite and helpful and couldn't do enough for you. We stayed in a standard room with a partial sea view and balcony on the first floor (1 floor below the reception area), the room was clean spacious and had a free soft drink minibar, TV, tea coffee making facilities which were replenished each day as well as bottles of water. The bathroom consisted of a walk in shower room, a bath with a shower, 2 sinks ,large mirror, hair dryer , shaver point, toilet and bidet. My only [slight]criticism of the room was that it didn't get any sun on it all day which meant that we had to switch on the heat for a couple of hours in the evening as it got a bit chilly , but what do you expect in November!!! The house keeping service was first class, it was cleaned every day and linen replaced, and if you ran out of anything (in our case milk)then it was replaced within minutes of requesting it via reception. The main buffet restaurant which is also located on the first floor was large clean and comfortable, the food was excellent and the choice was amazing , no wonder I have put on 5lbs in a week, the waiter service was top drawer, and your drinks were topped up regularly and quickly (if desired). We ate at the fish restaurant one evening which was quite basic in design but the food was fantastic as was the service, and also at the Italian restaurant which was my favourite , the decor was first class the food was exceptional and the service was brilliant. We didn't get to the Chinese as we had booked for a Thursday but then realised that the main buffet restaurant had a Mediterranean night that night so we cancelled our reservation (and didn't regret it). There are 4 bars in the hotel, the executive lounge(which we couldn't enter(much to my annoyance) as were in a standard room) the pool bar ,the Long bar and the Lobby Bar, this is where I have my only complaints, the lobby bar is quite small and often quite full which means you have to sit out in the seating area , however my wife and I took our drinks and sat on one of the sofas on the edges of the reception area , only to be told we couldn't drink there , which at first I accepted although we weren't aware of the rule , but what I soon realised was that there is a large area off the main reception area which had large sofas that catered for smokers , now as non-smoker I expressed my irritation that I was not allowed to sit in a non-smoking area on comfortable seating yet smokers had their own area, my complaint was noted by the management in the most polite way with a promise to review the rule , I was aware that others also had the same issue. My wife and I went into the lobby bar but soon realised that it has a section for smokers(inside) near the door, this meant that we had to endure the smell of smoke on our clothes, needless to say we never went back into the long bar. The pool area is very clean but a little crowded and sunbeds were at a premium , if you got to the pool after 9.00am it was difficult to find a place that had the sun most of the day and in November the sun disappeared about 4.00-4.30pm from the pool area. The main pool was heated to a comfortable if not warm temperature, the pool bar staff were exceptional particularly the waiter Carlos who kept us supplied with drinks all day. The beach consists of coarse sand but is quite large and spacious with beds and gazebo type areas, the reef near the beach was superb, I love snorkelling and took some superb photos under the water, whilst we were there it was quite win day so the opportunities to snorkel were limited due to the weather/tide, we did go on a trip to the 4 islands but saw nothing on the reefs there that was different to the hotels reef. This is an adults only hotel and part of the new Thomsons Couples range. 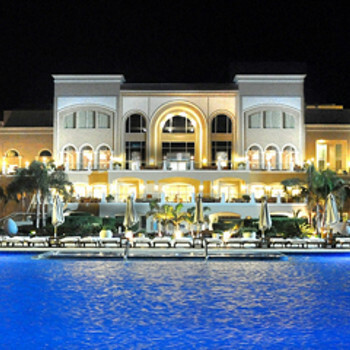 This is one of only a couple of new hotels in a new, up and coming resort of Sahl Hasheesh. There is a lot of building work going on around the area but no noise is heard at the hotel. This really is a hotel just to relax for a week or two, although there are several trips on offer. The hotel also has a shuttle bus (free of charge) into Hugarda to visit the marina and will also drop you at the new Senzo Mall. We had a basic room, although there was nothing basic about it! We had a desert view with side view of the sea and view of the mountains, lovely for sunset views. The room had a huge king size bed (bigger than my king size at home). Walk in wardrobe with built in cupboards and shelves and room to store the suitcases. There was also a built in safe - free of charge. There was also a free mini bar, refilled everyday with soft drinks, and we had a bottle of wine and fruit platter. Tea and coffee making facilities and a new carton of milk is placed in the mini bar every day. The bathroom was huge with bath and shower over, a separate shower cubicle, scales, toilet and bidet. The room was kept spotless and the carpet hovered every day. To us it wasn't worth the upgrade as the room was the same size but the deluxe rooms did have a larger bed!! And a view of the pool. The food was some of the best we have had. The main buffet Turquoise - had lots of choice. Extensive salad bar, choice of soups, about 8 choices of main meals including a carvery daily, lots and lots of different breads and rolls. At breakfast there is no bacon, but an omelette station and a chef cooking eggs anyway way you would like. Continental breakfast also available and waffles and pancakes also. Desserts were out of this world! Lunch could be taken in here as well or at the beach restaurant where salads, baguette sandwiches, cheeseburgers, and pasta dishes were available. You get to visit the al a carte restaurants once each per week, easy to book, either via the TV set or in reception with guest relations. The Italian (Bella) was lovely, plenty of choice and lovely fillet steaks cooked to order. The Chinese (Manderin) again lovely food, well cooked and plenty of choice. The seafood restaurant had some beautiful prawns and fish dishes. The waiter service to all the restaurants was quick and efficient. Although there are no top-shelf drinks available on the AI menu, the drinks that were available were very good. The wines perfectly drinkable and the beer (Local Saraka and Stella) were very good, plenty of cocktails too. Bottles of water freely available too. Plenty of bars, beach bar with comfy seats and settees, lobby bar, long bar (on 4th floor)with TV's and computers (free of charge)executive bar. All had waiter service. There are 2 main pools, one of them a saltwater pool -you just float along - just like in the Dead sea! also 2 children’s pools (no kiddies there now) Very comfy sunbeds including double sunbeds, loads of umbrellas, free beach towels. The staff will put the towels on the beds for you and put up the umbrellas for you - nothing is too much trouble for them (with or without a tip) No need to reserve beds, there are plenty. Waiter service from 10 am or just stroll to the beach bar. Lovely stretch of beach, loads of beach cabanas and beds A jetty to get in the sea, impossible to walk into due to the coral. Lots of snorkelling available. Sea lovely and warm. All the staff were wonderful, very happy in their jobs, all smiled and spoke to you - they love to learn English! The Thomson rep lives at the hotel and so is always on hand as is the General Manager - if you have any suggestions or problems bring them to his attention and he will deal with them immediately! The entertainment is low key with a singer most nights and a duo on other nights, sometimes at the beach bar, sometimes in the Long bar. Evenings spent just chatting to people at the bars, very relaxing. A few shops at the hotel, general shop selling souvenirs, a clothes shop, jewellery shop. There is a money exchange machine in the lobby giving a much better exchange rate than at home. All in all a lovely hotel, staff that really care that you are having a good holiday. Really enjoyed it and would go back ASAP! Hotel le Reve is a brilliant hotel! The staff, food, rooms, pool areas all worth 5 star rating. The bar and pool staff did everything they could to make us welcome. There was plenty of choice of food in restaurants. Our room was large with queen size bed plasma TV fridge safe tea & coffee making facilities. The bathroom had twin sinks bath and shower, with large walk in shower. There were bathrobes slippers, and a large balcony overlooking pool with sea view. Will come back next year.